I regret that I haven't seen this movie, Hidden Figures, sooner. What a remarkable movie and timely a movie it is. It is sad that the racial discrimination issues that the film depicts about from decades ago are forefront to our political environment theses days. 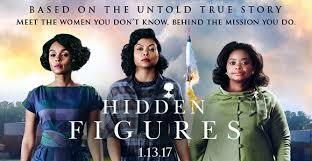 The movie is about 3 African American women working at NASA during the fledgling first of period of the space race between the US and USSR. The film is a star-studded cast of actors which deserve kudos: Taraji P. Henson as Katherine Johnson, Octavia Spencer as Dorothy Vaughan, and Janelle Monáe as Mary Jackson. The movie is brilliant. I'm going to watch it again. It is so hopeful in these days of terror we live in. It tells the saga of three black woman who work at NASA and ultimately become the most part of NASA's early space missions, with their mathematical calculations and ability to master the new computer systems. Talk about pioneering! This film tells the true story and does so with a masterful team of actors also, including actors Kevin Costner and Kirsten Dunst. I used to watch all Academy Award nominated films before the awards. I failed miserably this last last award season. This movie is fantastic. Please see it. I seldom find movies to watch that are interesting and worth the effort. This is definitely one of them.